President Moon Jae-in designated the southern city of Pohang as a special disaster zone Monday after a magnitude 5.4 earthquake hit the city last Wednesday. The president decided to designate Pohang as a special disaster zone in a meeting with senior secretaries and aides held at Cheong Wa Dae on Monday. "The government will mobilize all its administrative resources to quickly repair damage and do its utmost to make sure the college scholastic aptitude test (CSAT) will be conducted smoothly," Moon Jae-in said. "For now, repairing damage and conducting the CSAT smoothly are the top priorities," the president said. "Once the urgent tasks are over, the government will conduct a thorough review of its preparations against disasters." The president also said that the government will prepare the guidelines in advance for all possibilities as there might be more aftershocks on the day of the CSAT, which has been postponed to Nov. 23. He told test-takers and their parents not to worry too much and asked them to follow the instructions to be taken at the examination sites. 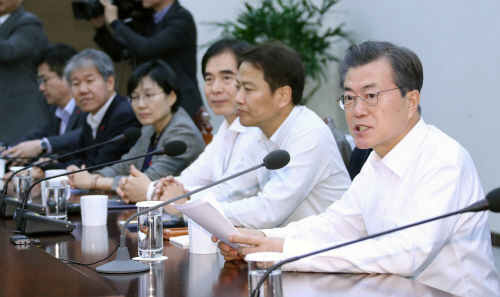 Earlier, Prime Minister Lee Nak-yon presided over a meeting at the Seoul Government Complex with related ministers on the Pohang quake, and decided to propose for declaring Pohang as a special disaster zone. "The government has sent special grants of 4 billion won for disaster relief on the day after the quake occurred. Today, the government will call for the president's approval for the declaration of special disaster zone," said the prime minister.